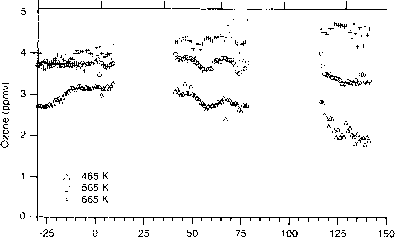 Figure 7.20 Time series of HNO, abundance at several equivalent latitudes in the high northern latitudes. MLS HNO, measurements (version 4) at 465 K in a ±1° equivalent latitude (derived from UKMO PV) bund are averaged to produce an average HNO, abundance for each day. 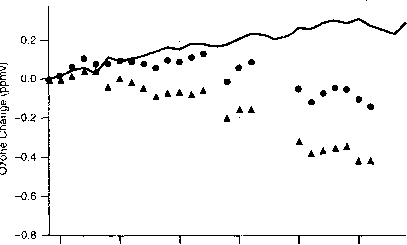 The time series has been smoothed to reduce the day-to-day variability. abundance, the dominant component of NOv in the lower stratosphere. There is little change of lower-stratospheric UNO, through the winter. Comparison with Figure 7.10, the comparable plot for the southern hemisphere, shows the dramatic difference between the hemispheres. The presence of temperatures below the chlorine activation threshold (~196 K, see Figure 7.18) suggests that CI, in the Arctic should be enhanced; in other words, the abundance of CI, should be much higher than its normal abundance of a few tens of parts per trillion by volume. Figure 7.21 shows that this is indeed the case. in the Arctic mean that less frequent PSC processing, and therefore less chlorine activation, occurs during the Arctic winter, and stops earlier in the year, than in the Antarctic. The upshot of this is that, in the Arctic, the rate of chlorine activation is lower and the rate of chlorine deactivation is higher than in the Antarctic. This leads to generally lower abundances of CI, in the northern hemisphere, as shown in Figure 7.21. It is also noteworthy that the interannual variability of CI, abundance is higher in the north than in the south. In the Antarctic the temperatures are so far below the PSC-processing threshold temperature of 196 K that interannual variability in the Antarctic vortex temperatures has little effect on the amount of PSC processing and, therefore, on the abundance of CI,. Consequently, CI, shows little year-to-year variability (see Figure 7.12). In the Arctic, however, the temperatures are much closer to the PSC-processing threshold. As a result, a variability of a few degrees can have a dramatic effect on the amount of air exposed to temperatures below ~I96 K. This leads to significant year-to-year variability in the abundance of CI, in the Arctic (Figure 7,21). As we will see, this year-to-year variability in the abundance of CI, leads to significant year-to-year variability in the loss of O, [2761. Figure 7.22 shows O, loss per day calculated for the northern hemisphere vortex during the last month of winter. Comparison with Figure 7.13 reveals much lower O, loss rates in the Arctic than the Antarctic. The amount of sunlight the polar regions receive is comparable, so the difference in O, loss rates can be almost fully attributed to differences in CI,. The rate of the ClO-dimer loss cycle scales approximately as ICIOJ", while the rate of the CIO-BrO loss cycle is linear in [CIO]. Thus, at the lower CI, abundances of the Arctic the CIO dimer cycle makes up about half of the total loss, compared to about two-thirds in the Antarctic. In both hemispheres the CIO-BrO cycle makes up most of the remainder, with the ClO-O cycle making up a few percent. In Figure 7.23 we plot vortex-average O, on several potential temperature surfaces in the lower and mid-stratosphere. Unlike the Antarctic (see Figure 7,15), Arctic O, shows little change during the late winter and early spring. This might seem pu/./.ling because we have shown that O, is being lost during this period. The answer is that significant transport of 0,-rich air into the vortex is also occurring, and the net result of these two processes is that there was little change in vortex O, in this year. Figure 7.23 Time series of O, abundance on Ihree potential temperature surfaces. Each point is one day of LIARS MLS O, data (version 4, 205 GHz) averaged over the Arctic polar vortex. 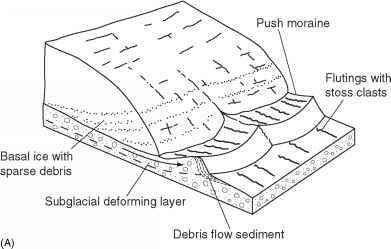 The boundary of the Antarctic polar vortex is determined from the method of Nash et a!. using UKMO PV.